Well, today we thought it was way past time that we shared some more artwork from Tim's work-in-progress, the second volume of his on-going "Science Fusion" graphic novel series, Worlds End - A Hard Reign's Gonna Fall. 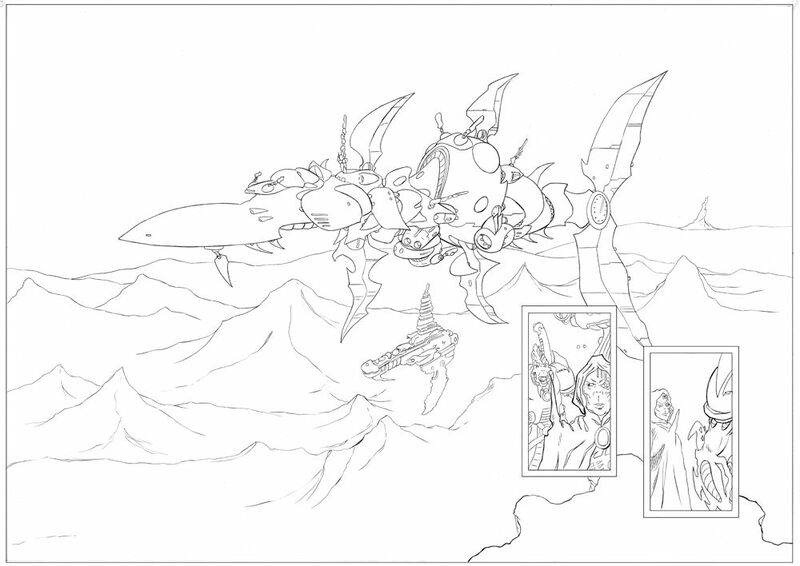 Today, it is time to show some more of the pencil pages, so without further ado. This first panel takes place on board the newly arrived Mother Ship, as Lord Gralltharr and the rest of the Aoevill Host are leaving his son, Lord Dhakross and his minions in a grand hall within its innermost sanctum known as, The Grand Reef. There's another teaser, but then you know us by now. This next one is one we were going to keep under wraps until after we went to Press, but it was just too good a shot not to let you see the real scale of the Aoevill Armada. Take a look at this one double page spread and then check out the scale of the uber-massive Battle Barge from Volume 01 - Riders on the Storm and see it dwarfed by the much larger, Mother Ship. Then bear in mind, neither of these craft are anywhere near the size of the (yet to be seen) Ark and the other "thing" that is coming. Yes, we know... another teaser!!! We hope you like this latest artwork and look forward, as always, to hearing back from any of you guys with your comments. Tim continues to forge forward with this second book and hopes to have it ready for painting very soon. When he does you guys will be the first to hear of it. Check back here real soon for more information and artwork regarding the second volume of this exciting series of All-Ages graphic novels.